What is a New Hampshire Sublease Agreement? New Hampshire Sublease Agreement: What Is It? In New Hampshire, a sublease agreement is a binding agreement that allows a tenant to form a rental relationship with another tenant. This situation would occur if the tenant needs to leave town for a period of time and does not wish to pay rent while he or she is gone. Instead of breaking the lease and having to pay penalties, the original tenant, known as the sublessor fulfills his or her rent obligations to the landlord while being able travel or move elsewhere for a period of time. A sublease agreement is especially helpful for those who plan to come back after an extended period of time away. For example, if a tenant is gone from the unit for six months and subleases the rental while they are gone, they do not have to worry about moving their belongings into storage and searching for a place to live when they return. One important fact about subleasing is that the original tenant’s name will remain on the lease, as this is a peer-to-peer agreement. This means that if any late payments were to occur, the sublessor would be held responsible. New Hampshire's tenant laws don't specifically prohibit or allow subleases, which means that your specific provisions lie in the terms of your lease. 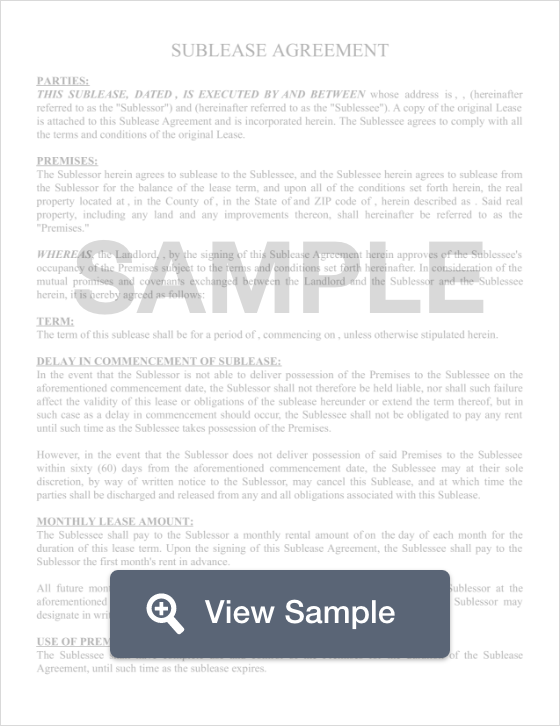 Whether or not you are able to sublease your rental will lie entirely on your lease and your landlord. As always, be sure to obtain written permission from your landlord.